Williams knocked out Mike Tyson in 2004. Only a handful of men on this planet can say they emulated the 1980s “Little Mac” Nintendo video-game character and knocked out Mike Tyson in real life. Danny Williams is one of those men. 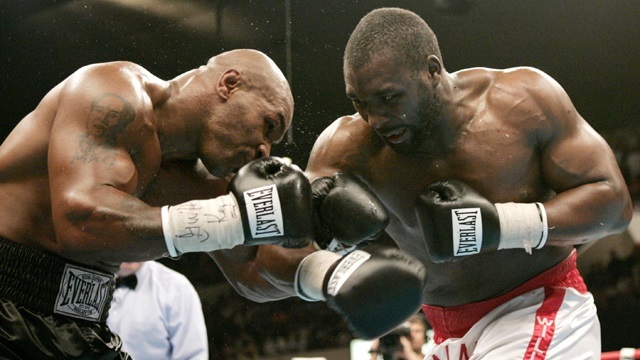 Back in 2004, Williams — a Muslim convert from London — pulled off a stunning upset when he floored the 38-year-old Tyson in Louisville, Kentucky. The fourth-round knockout all but signaled the end of Tyson’s career, and also marked the professional peak for Williams, who soon settled into a journeyman role and is still plugging along at 41 years old with a record of 47-25 with 36 knockouts and one no-contest. I thought he (Tyson) was made out of metal. But it started to go wrong for him: the money; the wrong people around him; too many girls; too much partying. There’s so many different factors. If he’d have gone on properly, with his old people around him, he could have beaten Rocky Marciano‘s [49-0] unbeaten record and gone down in history as the greatest, but with all the people around him, it went wrong. He was the type of fighter who was great when he was winning but he could never come back from the brink — like Evander Holyfield — and win. With Tyson, if he was winning he’d won, but if he was losing he’d lose. It’s sad to say but that attitude was in him. Tyson, who had himself converted to Islam while serving a prison sentence in the 1990s, would fight just one more time after losing to Williams. He would get knocked out again, this time by journeyman Kevin McBride, and retire from boxing. Williams turned his big win over Tyson into a WBC Heavyweight title shot against Vitali Klistchko, which he lost via 8th-round TKO. Williams later defeated former British phenom Audley Harrison for the Commonwealth Heavyweight title in 2005, defending it once successfully before losing it to Matt Skelton in 2006. In 2011, Williams suffered a TKO loss to former NFL defensive lineman Leif Larsen, which kicked off a nine-match, two-year losing skid. Although he has gone 3-15 in his last 18 fights, Williams was victorious the last time he stepped in the ring, knocking out Radek Varak in April 2015.